There are a number of factors that play into the increased fatality rates those see in rural areas compared to their urban counterparts. Of these are the environment, common occupations and the upbringing of those who are accustomed to working in agriculture, mining and construction. The group that is at greatest risk is that of young workers, who are more likely to be involved in accidents due to inexperience and poor decision making skills. Because young workers working in rural areas are twice as likely to die in an accident as those living in cities, more precautions need to be applied on the job. Farming and agriculture is among the most deadly occupations in the country and the dangers workers face are often extended to family members who live near the workplace. It is estimated that 167 farmers are injured every day on the job and up to 400 are killed each year. Every year, hundreds of thousands of children are employed on farms and could be injured due to factors such as inexperience, reckless behavior or lack of knowledge. In 2012, there were nearly 14,000 injuries involving children in agricultural occupations. In addition to the danger presented by farm work, children living in rural areas may encounter mines and construction sites that present similar dangers. Some of the factors that may influence any form of injury on rural job sites include the following. Falls from machinery, grain bins, scaffolds and other structures or objects at a great height. Suffocation occurring when the victim falls into a grain bin. Long term exposure to the sun, resulting in the development of cancer and other skin conditions. Exposure to chemicals, pesticides, fertilizers and hazardous vapors that are commonly produced as a result of agricultural work. Injuries sustained by working in extreme heat or cold such as heat stroke, hypothermia and frostbite. Injuries sustained by working with or around livestock. Accidents involving heavy machinery. These accidents may result in permanent injury or death. The following tips may reduce the chance that your child is involved in an accident if you live or work in a rural area. Prohibit your children from climbing machinery, buildings or any other structure. Make sure they understand the danger in doing so. Teach your children from a young age how to properly approach animals such as horses and cattle and how to avoid being charged or trampled. Cordon off specific areas that your children can play in safely so that they do not venture into dangerous terrain out of boredom. Never let a young child ride a horse without supervision. Keep all chemicals and flammable materials locked away in a location your children are not able to access. 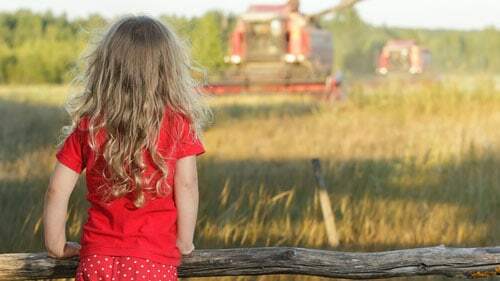 Do not allow your children to ride on a tractor with you and make sure that they are not permitted on any transport vehicles or other heavy machinery. Before you allow your child to work on a farm, make sure that he or she is both physically and mentally fit to do so. Many accidents are the result of inexperience or poor judgement, so it is important that your child exhibit the ability to make good decisions before allowing him or her to work. In addition to the risks that are present due to agricultural work, children living in rural areas are more likely to be killed in fires, drownings and ATV accidents. One of the reasons for this is because emergency responders are much farther away and unable to reach victims quickly when they have been injured. The most effective way of curbing these risks is to supervise your child whenever possible. Whether it is for a swim in a nearby lake or to ride an ATV, children will be safest when they are in the presence of an adult who can intervene in the event that something goes wrong. Teaching your children about the dangers of drowning, fire and reckless driving are paramount. For more resources on how to keep your children safe in rural areas, you can visit any of the following websites.